So Quorn, hmm. Not really sure how I feel about it if I’m honest, but it works really well in this dish, mainly because I adapted it from a meat recipe. When I was a kid, I used to get furious bolognese envy. I’d look over at my best friend Philippa shovelling forkfuls of cascading spaghetti into her mouth, flecked with delicious, oily meat and cheddar cheese. 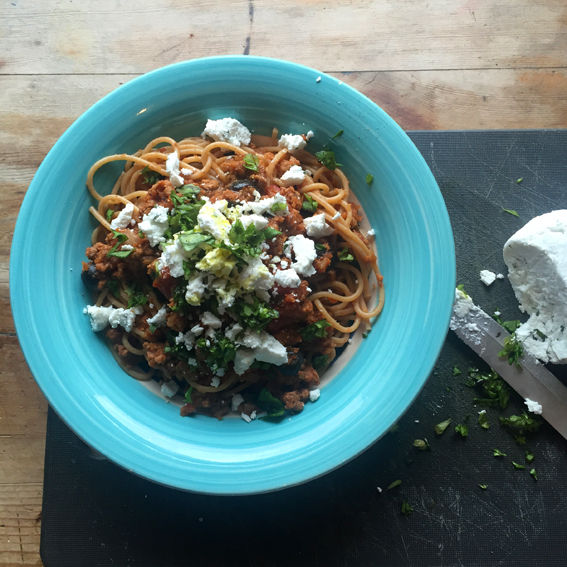 I would then woefully look down at my plate, a lone soggy stuffed pepper staring up at me, I wish I was dead… Okay so that’s perhaps a little dramatic, but I wanted to create a decent alternative to bolognese that would make little Corrie very happy. I now cook it all the time and everyone loves it, it’s cheap (about £3 per portion) and easy, although it does take a couple of hours in the oven so I always make it on a lazy Sunday. Enjoy! (Oh and I use a hand blender in this recipe to blend the vegetables but just because I do this doesn’t mean you have to. Simply chop your veg up smaller, blending doesn’t make much difference, I just prefer the texture). You’ll need: A hand blender/ food processor. A oven-proof cooking pot with a lid. ❄ This bolognese is suitable for home freezing once cooled. Store in an airtight container for up to 3 months. 1. Preheat your oven to 160°C/140°C fan/gas mark 3. In a large oven-proof pot, on a medium heat, sweat the onion, carrot and celery in the oil (if the onions start to stick, add a dash of water to prevent the vegetables from burning and to help them steam). 2. Once soft, take off the heat and roughly blend the vegetables with a hand blender or food processor. Return to the heat and add the mince and the milk. Cook for a few minutes until the milk has absorbed before adding the tinned tomatoes. Break the plum tomatoes up a bit with a spoon and add the white wine, olives, nutmeg and a generous sprinkle of salt and pepper. 3. Put the lid on a jar and cook slowly in the oven for up to 2 hours, stirring halfway through. 4. Remove from the oven and serve on top of spaghetti, with torn fresh basil, a drizzle of extra virgin olive oil and a good crack of salt and pepper.